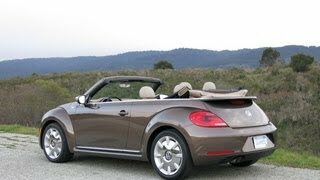 Volkswagen unveiled the latest Beetle Convertible, the third-generation of the iconic VB ragtop, ahead of its debut at the 2012 Los Angeles Auto Show. 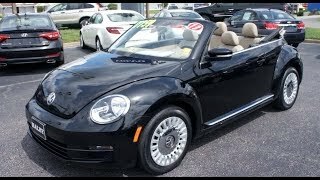 Volkswagen has stuck with a traditional soft-top rather than a hardtop which makes the Beetle Convertible’s top open and close in a little over 10 seconds at the touch of a button. 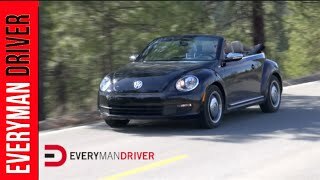 The new Beetle Convertible will be available in three engine options: A 2.5-liter inline five-cylinder engine, rated at 170 hp and 177 lb-ft of torque. It will be mated to a six-speed automatic transmission. Diesel buyers can go for the 2.0-liter diesel four-cylinder engine, rated at 140 hp and 236 lb-ft of torque. It can be mated to a six-speed manual or a six-speed dual-clutch automatic transmission. 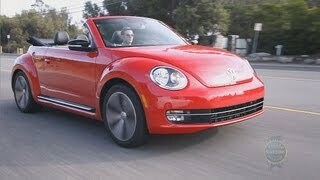 VW says the diesel with the manual transmission will get 41 mpg on the highway. 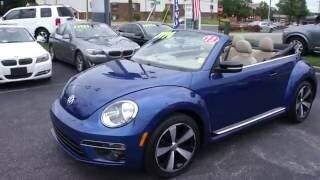 Also available is the 2.0-liter turbocharged four-cylinder engine, rated at 200 hp and 207 lb-ft of torque. This engine can be mated to the six-speed manual or six-speed dual-clutch automatic.